Fricasee is my word of the day. For some reason, I woke up thinking of it. It is a dish of cut-up pieces of meat (as chicken or rabbit) or vegetables stewed in stock and served in a white sauce. I first remember hearing the word in either a cartoon or a Restoration play in college. If you’re interested in a digital book talk, created by Bonnie Barnes of Region XI in Fort Worth, that you might could use to introduce the story of Jim Limber. Use this site. I’ve just ordered a Model Summer by Paula Porizkova and Snuff by Chuck Palahniuk. They should be in any day and I’m looking forward to reading them. I’ve been so busy that my reading has been slower than usual. I’ve got to remember that I am a writer, and that writers, busy or not, READ. I’ve also been given two new books this week. The first I received at the Memorial Day celebration on Monday, The Oxygen Revolution. Hyperbaric Oxygen Therapy by Paul G. Harch, M.D., and Virginia Mccullough. This treatment is being used with success with troops returning from Iraq with head wounds or trauma. Dr. Harch was there. Along with Kay Katz and Mike Walsworth, he was a speaker for the event. The second book I received yesterday at the End of Year Luncheon for the Caddo Parish ISD librarians. Their organization is called CASL. This group of librarians has the best camaraderie I’ve seen. Librarians are my favorite people, and I think some of the least appreciated. They are also the last ones in education to be holding forth the lamp of cultural literacy in this day of State testing and resulting mediocrity. I intend to write some pieces to honor them. The event was held in the University Club in downtown Shreveport on Market Street and was a delightful program (in spite of the fact that I was the speaker for it). The theme was “Master the Art of Reading.” The book given to me was a signed copy of The Defense of Vicksburg: A Louisiana Chronicle written by All C Richard, Jr. & (Librarian) Mary Margaret Higginbotham Richard. I couldn’t have asked for another gift. I hope to have some photos of the event soon. Here is a photo of Cindy Harriman. 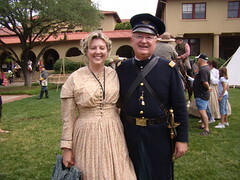 She works with the Texas Civil War Museum. A beautiful and talented lady, she is doing so much to keep the history of the War Between the States alive. The gentleman is named Doug Harman. He is the retired CEO of the Fort Worth Convention and Visitors Bureau.